This guest post is by Claudia Ocello, President & CEO of Museum Partners Consulting, LLC. Claudia has over 25 years’ experience in museums working on exhibitions, education programs, accessibility and evaluation projects. In 2008, Claudia was honored with the Award for Excellence in Practice from the Education Committee of the American Alliance of Museums (2008) and the New Jersey Association of Museums’ John Cotton Dana Award (2013). Not taught at other schools. they make up their own rules. The students at Diffendoofer School ace their standardized tests because they have gained so much knowledge and skills that don’t come from book learning. The book reminded me of question that has been nagging at me for weeks: What if our museum programs didn’t align with curriculum standards? 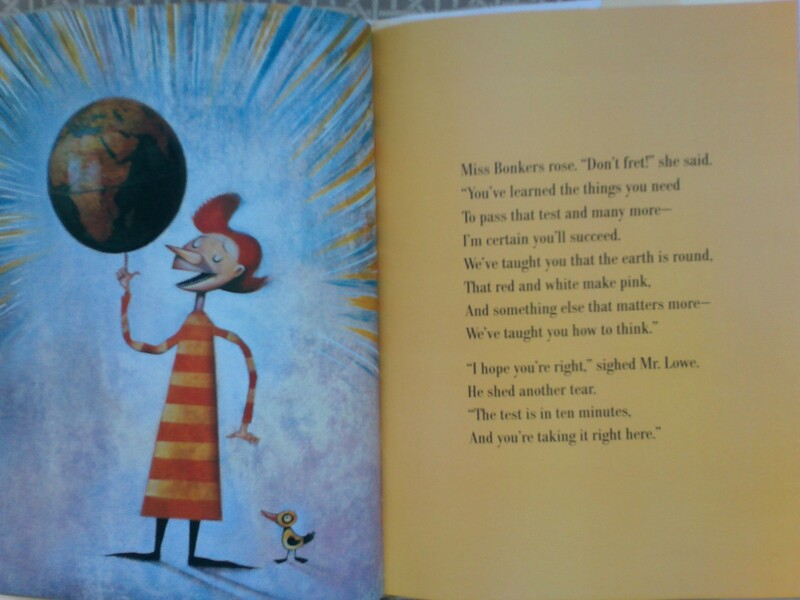 A page from “Hooray for Diffendoofer Day!” Photo by Claudia Ocello. In May I spoke at the Association of Children’s Museums conference about working with a museum to revise their education programs to align with curriculum standards, and how successful that change was for the museum. And a recent project for my consulting business included watching videos of a museum’s education programs and creating a chart of standards alignment for the museum’s website. But this work has led me to think more about how content standards influence museum school programs, and to wonder if we should be thinking differently. Arguably, current content standards are better for museums than previous versions. For example, the Common Core English Language Arts standards‘ emphasis on “informational text” is great for archives and exploring primary source documents. These standards also include speaking and listening skills, which works well for museums that encourage students to share responses to art or artifacts in the form of a presentation, skit, or artwork. Next Generation Science Standards emphasize being able to do something (create a model, use evidence, evaluate evidence, etc.) over factual knowledge (i.e. naming parts of a flower). There are many museums who have embraced and developed well-received programs that connect museums and schools along the curriculum standards (see this issue of the Journal of Museum Education for some great examples). There’s so much going on in the field of education: dissatisfaction with the current educational system; protests over standardized testing; alternative forms of credentialing; a rise in homeschooling; and more. Museums have responded to these trends, but most still keep one eye on curriculum standards in developing and advertising their school programs. We tout museums as being different from schools. We teach using unique methods and unique objects in unique settings. Yet we still market our school programs through alignment with school standards. What are we really promoting, then – more of the same? When I was a classroom teacher there were no curriculum standards to follow (yes, it was that long ago), and standardized tests were really just benchmarks. We were never instructed to “teach to the tests.” We took field trips because they matched with subject matter – for example we took our kids to see original Egyptian artifacts when we were studying ancient Egypt. It was more about the experience, and seeing authentic artifacts, than addressing certain standards for learning. When the standards came along, museums began claiming that teachers could “meet” curriculum standards with a museum visit. We needed – and some would argue, still need – to ensure schools see value in a museum visit. But with the changing educational landscape, why are we still touting how much we are in line with the aspects of formal education we don’t necessarily like? What could museum’s school programs look like? Curriculum standards are easy pegs to hang our hats on. They help us justify our services and create a reason for museums to offer programs for schools. Standards-aligned programs reinforce what is going on in schools already. But if schools and teachers are already teaching to, and meeting, curriculum standards, what do they need museums for? What if instead of following the school system’s lead, we took on the role of school reformers? For example, what if instead of aligning with the Common Core, we taught children to be innovators, rooting programs in skill sets such as Tony Wagner’s list of skills innovators need? Or our programs fostered characteristics such as flexibility and open-mindedness? What if we aligned museums with educational thought-leaders such as KnowledgeWorks instead of with existing public school policy? I am not suggesting we should completely abandon curriculum connections in favor of developmentally-appropriate concepts and practices, but I am suggesting that we use the latter to frame our current work and move beyond it. If the sixth graders in your district study ancient civilizations, and that’s part of your collections, use the objects as a jumping off point for your program (there’s the content). Now imagine moving beyond teaching the content of culture, civilization and art, finding ways to cultivate metacognition, curiosity, and associative thinking. What could that look like? Some museums are already engaged in this work. The Columbus Museum of Art has been focusing their education programs on how to think like an artist. (See also Journal Of Museum Education, Vol 39, No 2 July 2014 which is dedicated to exploring Columbus Museum of Art’s process in rethinking/refocusing their programming.) and the Peoria PlayHouse Children’s Museum promotes a program called Explore/Challenge/Become which promotes curiosity and experimentation. Neither of these museums mention curriculum standards in marketing materials, with few complaints from teachers or administrators, and many booked programs. Accokeek Foundation’s Eco-Explorers: Colonial Time Warp programs “supplement” social studies and environmental education and encourage decision-making skills and physical activity. While they had a few complaints from teachers and some issues with staff when they introduced this new format and emphasis, the program won EdCom’s Innovation in Museum Education award in 2016 from the American Alliance of Museums. I’d love to know about other museums that are straying from standards-aligned school programs and what the response is from audiences and staff (please comment below!). One of the focus areas for the American Alliance of Museum’s 2016-2020 strategic plan is P-12 Education. As part of this plan, AAM is pledging to better integrate museums into the K-12 landscape. I am already encouraged by the creativity I have seen in the responses to the Center for the Future of Museums’ Education Future Fiction Challenge, and the creation of a Ford Bell Fellowship to address museums and education. I would love to see museum educators have a role in shaping education at the policy level. Imagine if the next Education Secretary had a museum background! If your museum is interested in rethinking your school programs to move away from basing them on curriculum standards, I encourage you to experiment. Maybe you are event considering about how to entirely reinvent the school program format. Share how your museum is straying from standards-aligned school programs, the outcomes of your experiment, and your questions and thoughts. You all deserve a bow. *From Seuss, Prelutsky, and Smith’s Hooray for Diffendoofer Day, with a bit of artistic license by the author. Journal of Museum Education. (2014). Intentionality and the 21st Century Museum. Vol 39 No 2: Museum Education Roundtable. Journal of Museum Education. (2015). Common Goals, Common Core: Museums and Schools Work Together. Vol 40 No 3: Museum Education Roundtable. Seuss, D., Prelutsky, J., & Smith, L. (1998). Hooray for Diffendoofer Day. New York: Alfred A. Knopf. Wagner, T., & Dintersmith, T. (2015). Most Likely to Succeed: Preparing Our Kids for the Innovation Era. New York: Scribner. Special thanks to Nathan Richie for helping me think through and better articulate these issues. August 15, 2016 in Exploration: Schools and Museums. ← What are your best maker-based activities? Hi Claudia! Thank you for bringing up this tough topic. At my current institution, aligning school program content to academic standards is something we’ve felt challenged by not only because we are also advocates of the “art for art’s sake” idea, but because our school programs are so successful that we’ve been encouraged by the powers that be to continue moving in this this direction. Foot traffic has increased significantly since the development of our school programs (not that this is solely how we gauge “success,” but it is one factor that impacts our decision-making). Most importantly, our teachers love these programs. Our administrators support them because they are familiar with the general idea- they’re comfortable with them. I love the idea of having programs that develop and promote skills and topics other than school content. However, it seems very often the only way for teachers to get field trip approval is if they can easily justify the program’s relevance to curricula. I’m wondering how we can get our schools to buy-in to a program centered around say Tony Wagner’s list of skills for innovators ? How do I get buy-in from my powers that be to support that type of programming when they already deem our current model successful? Additionally, I would argue good tours and school programs inherently encourage soft skills, critical thinking, creative development, and other types of skills students need. So why change the way we promote if we can sneak in the good stuff anyway? Here, we focus on the Four “Cs”: Critical Thinking and Problem Solving, Communication, Collaboration, and Creativity and Innovation. To me, the NEA promoting these skills via the 21st Century education movement is a step in the right direction! We try and incorporate these skills in all our school programs AND align them to curricula. And lastly, I sincerely hope that the next Education Secretary has a museum education background. Thank you again for this great question! Great post Claudia! I love this topic. Beginning with the rise of standardized tests in the early 2000s, I think museums have become followers rather than leaders when it comes to school field trip design. In focus groups I’ve conducted, teachers say that the most important thing to them is that their students are engaged. Of course we need to help them figure out what boxes to check off so that they get permission to come. But we can be creative about this. Are we making our content relevant and meaningful to today’s students? This should be our most important goal. Maybe it’s time to re-think. Thanks for your comments Andrea, Becky, and Annemarie. Annemarie – sounds as if you are including some great skills in your programs. What if you showed the powers that be the blogpost and looked at what some of the leaders in the “moving-away-from-standards” movement are doing? I’d also consider holding focus groups with principals and teachers and school administrators to see what they think about making changes. Perhaps at the local level if you got buy-in, you could convince your “powers” that a change would still be successful. Cindy Foley mentioned in her post on this blog that the principals actually said to her that they wanted the museum to teach what they couldn’t do well in the schools. Andrea – So glad the conversation is opening up at a national conference, wish I could be there to participate! Maybe it’s time for EdCom to revisit the Principles and Standards. Relevancy should be included in the EdCom document, just as you mentioned. Good luck with the session! Annemarie – what if you used this post and the links/videos in it to share with your supervisors to start a discussion? I’d also suggest holding focus groups with school principals and other board of ed staff to see how your museum could fill gaps in what the schools are not teaching. Maybe that could help you change the format/focus of your school programs, or at least make some adjustments that could be the first step. 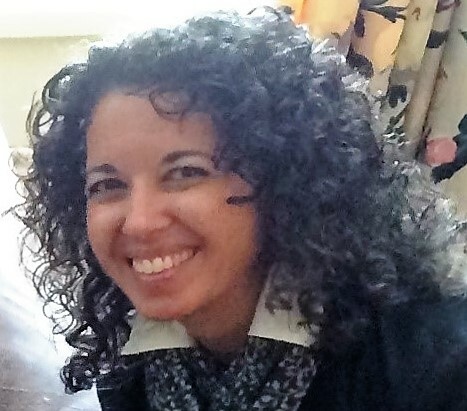 Andrea – Wish I could be a participant in the AASLH audience! So glad you are continuing the conversation. And, it is time to revisit the EdCom Principles and Standards Document – I will see what I can do about that, thanks for calling it to my attention. Relevancy should be included. Claudia, Thanks for your thoughtful post. I couldn’t agree more. There was a time when we attempted to align our school tours with local and national standards and frankly I don’t feel that we met most of those, that we supposedly addressed, very well. This wasn’t/isn’t what we do best. Inviting students to slow down, look carefully, think deeply, and have rich conversations around original works of art has so many powerful benefits for learning that we have shifted our aim to support and encourage these more open-ended kinds of discussions that may or may not tap into curricular content. We still have school tours themes that connect with subjects taught in school, at various developmental levels, but our objectives have changed. I think our tours are more impactful as a result. I also love your thought about what the general education field might learn from museum education! Yay! Thanks Heidi! Great to hear that your museum has changed objectives and is encouraging more open-ended discussions that are not always tied to curriculum. How did your supervisors respond to the changes? What about teachers, any push-back to go back to the “old way?” I’m also curious if you’ve done or are planning any evaluation to support your thinking that the tours have more impact. What language do you use to market those new programs? “If you could step into a landscape, what would you hear or feel? This tour explores how artists depict the natural world and invites students to use their imaginations while exploring art and the themes of nature. • Drawing on prior knowledge to generate ideas about works of art. • Observing, describing, and sharing ideas about nature in art. • Comparing and contrasting works of art that depict nature. One thing that some teachers do object to is how few objects we cover in an 60-75 minute tour. We typically make 4 or 5 stops on a tour–some might be single objects, some comparisons, and some stops use the whole gallery. Many teachers love this more in-depth approach; while others want to cover more ground in less depth. We try to set clear expectations about our “less is more philosophy” but not everyone agrees. Wonderful post here, and I am thoroughly enjoying the comments and thoughts that have followed as a result. I have conflicting thoughts on this issue, and I think part of it goes into the way we, as museum educators approach our connection to classroom standards. We begin with the classroom based learning standard (state, national, local, etc…) and build a program that conforms to filling this standard in hopes that schools (at a specific grade level) will bring their students to either fulfill that standard, or supplement that standard with items from our collection or learning experiences that only a museum can offer. Here it depends on your goals. If your goal is to get more people through the doors, and to draw more students into the museum, and you see a dramatic rise in visitors through this approach, perhaps you see this as a victory. It’s probably not a bad thing for the museum. It doesn’t do much for the argument that Museums are Essential. It says, Museums are Flexible, Museums are Adaptive to the Needs of Schools, Museums can Arrange Themselves in Useful Ways perhaps… but not Museums are Essential. Things that are Essential don’t engineer themselves in this way. Oxygen, for example, is essential. You don’t need a list of reasons how oxygen connects to the respiratory system, which in turn is necessary for breathing, which is entirely helpful for those who enjoy living. So why not give Oxygen a try? Please. Essential means that the usefulness is self-evident. We don’t think about breathing. As students we don’t think about going to school everyday, we just know that Monday through Friday from Labor Day through Memorial Day, we’ll be in school. For those of us in the museum field, we know that museums are essential. That the sort of learning that takes place in museums, historic homes, etc… is powerful. That while the 179 days we spend in school over the course of the year might, for the most part, blend into a long, slow climb up Learning Mountain, an experience in an “informal” learning environment assaults the senses, emotions, intellect, and creativity in ways that cause a spike in learning. That the learning that happens in museums is sticky, it lasts with us and lingers in our memory often for years. Begin with the end in mind. What does our audience/ our students/ our teachers need? What items from our collection? What experiences that we can craft? What collaborations can we forge? How do we connect content, community, our collective resources in ways that uplift the very soul? When crafting a program or experience- how do we identify and fill the need- which might involve discovering and filling a gaping hole in the standards? This is what museums do best. No two museums are alike, so focusing on what value your museum and your people can add to what learning looks like in your community, is going to be different from place to place. And isn’t that what many of our institutions celebrate? The artists who view the world differently, and through their art bring a new world into being? Or the visionaries of history or science who, rather than looking at the world the way it was, imagined new possibilities and made them so? So is it the job of a museum to conform and build to standards that are not ours? Or to envision new standards, to craft our own set of standards, with the knowledge that our value as individual institutions might not quite fit into the boxes created at the state and federal levels? Thanks for getting me thinking about these things. Thanks for your post and the resources it includes! About three years ago I began working at an art museum that did not have a lot of existing programs or education infrastructure. At first, I thought we needed to create a menu of options for teachers, offering choices that aligned with curriculum standards. But a different way of doing things took hold before that menu ever got made. We have a group of practicing artists in various disciplines who work with teachers and students in schools. For field trips to our museum, we began asking each artist to come up with an activity (or opening questions for) an artwork or area of the museum that spoke to him/her. Visiting students rotate through these stations, responding to art through movement, sound, writing, sketching, silent looking, discussion, games, etc . Artists are encouraged to experiment, and to switch up the art that they work with (sometimes in response to what students have been doing at school, but also so that the process remains a living, dynamic one for the artists). Students may do and see a variety of unpredictable things on any given field trip, but all students interact with several artists, each of whom is modeling his or her own way of making meaning from or taking inspiration from art. Instead of starting from a curriculum connection, we’re starting with a spark of interest coming from the interaction of a particular individual and a particular piece or aspect of art. Every fall about 2500 5th graders visit our museum for tours led by volunteer docents. This year, rather than having students go on 60 minute tours led by one docent, we’re going to try this station rotation format. The focus of the tours will be “How do we learn from, connect with and enjoy art?,” and each docent has been asked to reflect upon what interests or excites them about art and to choose an artwork (or several) that they want to spend time researching and experiencing with 5th graders this fall. I am curious to see how it unfolds and what the response from all parties will be. Our hope is that students will leave with the interest and some of the tools they might need to enjoy returning to the museum on their own. Thanks Claudia and others, so much for this thoughtful discussion. I’m looking forward to getting my own copy of “Hooray for Diffendoofer Day.” I give pause at the suggestion to pull museums away from aligning with school standards, not for the sake of giving up the exciting and creative learning that can only happen in a museum, but because we should give students a chance to apply their classroom learning (determined by standards) in diverse environments. Why should we steer away from helping students build these connections? 1. We want all teachers to come to museums, not just the ones armed with an adventurous spirit, willing to go outside their requirements, buck their administration, and personally take on the role of building learning bridges for their students to our collections. If we only serve those educators, we severely limit the impact museums can have on the P-12 learning world. Alignment opens doors to less-experienced educators to see how standards can come alive in different learning environments. If moving away from aligning to standards to other learning platforms, be sure to provide training for novice teachers so they can maximize the experience beyond your expertise. 2. Some standards are moving closer and closer to aligning with museum work. The C-3 Framework out of NCSS asks students to ask big questions, analyze sources, draw conclusions, and communicate them to an audience. This is just what we, as professionals, do in history museums. Designing a museum tour around the c-3 framework leads students straight into the museum’s sweet spot for expertise. It seems we should be running towards some standards and championing them, not avoiding them. 3. As much as we in museums toot our own horn as educational resources, the school systems and standards will ALWAYS be bigger and have a more direct influence on what teachers can and do. Schools generally still don’t list museums as educational resources in their communities. Their public sharing of standards is a great resource for us to get a peek inside their world and a cheat sheet on how to best connect our resources to their needs. We should be thankful this information is shared with us so that we can better articulate our relevance. The schools can learn to trust that in our hands, that learning happens in a totally different way! I think it speaks volumes that it was the *docents* that pushed back against program changes, not teachers or supervisors. Appreciate you including the description of your program as a model – no standards mentioned! Although you do include some language that is IN the standards – like compare and contrast, etc – which I wonder if teachers read and think,”oh, that works for my classroom and curriculum.” Wonder if it might be worth asking teachers (formally or informally) after a program why they chose that particular program and how it fits into their classroom work, and see if the word “standards” ever comes up. Brava for your experimenting! Hope you will do some evaluation and reflection with the docents/artists to see how this change impacts their experience and what they notice about the students. I notice you are revolving your programs around a question sparked from the interest of the artist- very much akin to an essential question – that teachers may be familiar with as part of the Backwards Design way of lesson planning. What might happen if you were start the programs based on a work that spoke to the students? Would love to know where you are working! Love the idea of thinking about what our approach to programming says about our museum. That is an interesting perspective that I certainly hadn’t considered. When you say “design with the end in mind” I can’t help refer back to “Backwards Design” which I do like and use as a lesson planning method within the museum (used already by many classroom teachers) If anyone’s not familiar with it, just search for it – there are a lot of resources about it! Glad to have sparked your thinking about this – hope we can continue talking about it. Really appreciate your counterpoint, and your arguments are well-grounded. I do agree with you about the C3 Framework and hope more teachers (and museums) are using that instead of the state standards. If schools are bigger (and might always be) – why can’t we try to influence them then at a higher level? We need museum educators to be part of the Federal Dept of Education then, or at the state level at the very least, to try and influence policy. I don’t think we always have to toe the line in order to bring in audience. As Heidi and Kate pointed out, there are ways of doing what we do and still working with schools, in Heidi’s case without complaints. Thank you all again for your thoughtful insights and sharing!